Because of Letter VII's declaration about Cumorah, many LDS intellectuals have a serious problem with President Cowdery's historical letters. They would rather not talk about them. They would prefer that people never find out about them. Consequently, you won't read about them in most Church history publications. I've documented several instances where they are referred to only as obscure letters published in the Messenger and Advocate along with lots of other long, boring articles. So far as I've been able to discover, until my Letter VII book came out, no one published an explanation of how ubiquitous these letters were. The closest was Peter Crawley's Descriptive Bibliography of the Mormon Church. This is strange because President Cowdery's letters deal with serious issues that people still confront today. In addition to the details about early Church history he provides, President Cowdery addressed the complaints that prophets are not perfect men (Letters II and VIII). He discussed the reasons why people do and don't accept the gospel. He explained in detail the things Moroni taught Joseph about the fulfillment of Old Testament prophecies. Letter VII's teachings about the Hill Cumorah should have resolved that issue long ago, but that letter also deals with the question of worldly temptations when doing the Lord's work, using Joseph's hope to find something valuable to sell along with the plates. These are just a few of the reasons why people should study these letters. When viewed this way, we can better understand why Joseph Smith made sure all the members of the Church in his day had access to the letters by publishing them in all the Church magazines. Here's how the Joseph Smith Papers have addressed the letters. They provide a Source Note and an overall Editorial Note or Introduction. You'll notice that in Joseph's journal entry, he refers to the letters as "President Cowdery" letters, but the Joseph Smith papers refers to them as "Oliver Cowdery's" letters. That's an editorial decision, of course, and I'm not saying it's incorrect. But it does contribute to the sense that these letters contain merely obscure opinions of Oliver's. For Joseph Smith, though, they were President Cowdery's, reflecting Joseph's recognition that they originated with the First Presidency. Furthermore, Joseph considered them part of "a history of my life," not merely obscure opinions. Oliver Cowdery’s series of eight letters on church history published in the Latter Day Saints’ Messenger and Advocate between October 1834 and October 1835. 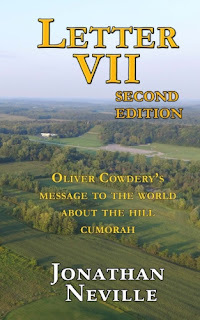 You'll notice that they never mention Letter VII's teachings about Cumorah or even President Cowdery's detailed description of the stone box, both of which are especially important. I think the people working on the Joseph Smith Papers generally agree with the M2C scholars, so they don't want to even refer to these important aspects of the papers. Also, the note refers to History, 1834-1836, as a "repository" of these letters, but they don't mention how often the letters were republished so all members of the Church could read them and have access to them. This omission contributes to the misperception that these letters were obscure, irrelevant opinions instead of a major part of the context in which Church history was understood while Joseph was alive. This editorial approach does a disservice to members of the Church who don't understand why so many prophets and apostles have taught that there is one Cumorah and it was in New York. and published them as a series in the Latter Day Saints’ Messenger and Advocate between October 1834 and October 1835. The titles and formatting employed in this history are similar to those in the published series of articles, indicating that the Cowdery letters were copied into the history from the Messenger and Advocate, not from a manuscript version of the letters. recounted his experiences with JS beginning when the two first met in April 1829. The letter includes an account of the vision he and JS had of John the Baptist, who gave them the authority to baptize. After composing this letter, but before its publication, Cowdery developed a new history-writing plan: he decided that in subsequent letters he would relate the “full history of the rise of the church,” beginning with JS’s early life and visions. As editor of the Messenger and Advocate, Cowdery prefaced the published version of the first letter with an explanation (also transcribed into the history) of the new plan. Although he had no firsthand knowledge of church history prior to April 1829, Cowdery assured his readers that “our brother J. Smith Jr. has offered to assist us. Indeed, there are many items connected with the fore part of this subject that render his labor indispensible.” Some passages in the ensuing narrative seem to have been related to Cowdery by JS, since Cowdery recounts events in which only JS participated. provided the most extensive account of the origins of the Book of Mormon published up to that time. He related JS’s initial visions of the angel Moroni and, using biblical prophecies, elaborated on the angel’s message concerning the gathering of Israel in the last days in preparation for the Millennium. Cowdery continued his narrative up to, but did not include, JS’s receiving the gold plates in September 1827.
in October 1835, the month of the Messenger and Advocate issue in which his final installment was published. By the time Williams received the history, Cowdery may have already written the final letter; he had at least conceived of it as the final installment in his series. With the serialized Cowdery letters complete or nearing completion, the new history kept in the “large journal” could serve as a repository—more permanent than unbound newspapers—for a copied compilation of the entire series.